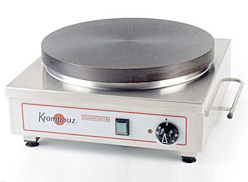 The Krampouz 16 inch electric crepe griddle CECIF4 from Eurodib has a 15.5 inch cast iron cooking surface and a stainless steel exterior. Sturdy, protective bar. Precise thermostatic temperature control and three heating elements that provide even heat distribution with a combined 3,600 watts of power. Heats the griddle up to 575°F for fast cooking and quick recovery times. 8" x 16.75" x 17.38"